Schaeffler development platform provides means of reducing hybrid vehicle power train length by reconfiguring the IC to hybrid transmission shift. CO2 limit values on important automotive markets will be tightened even further over the next decade. The European Union, for example, is planning to reduce the 2021 fleet target of 95g of CO2 per kilometre by another 30 per cent by 2030. At the same time, several markets, such as China and California, have fixed regulations in place for vehicles with alternative drive trains. Given that not only legal requirements but also customer preferences vary from country to country, Schaeffler’s new E-Mobility business division focuses on a variety of different drive systems. In order to be able to design cost-effective electric and hybrid vehicles in spite of this, the electric and electronic drive components are based on a shared development platform. This platform comprises both hardware components such as electric motors and power electronics, as well as essential software modules that are required for regulating the drive. 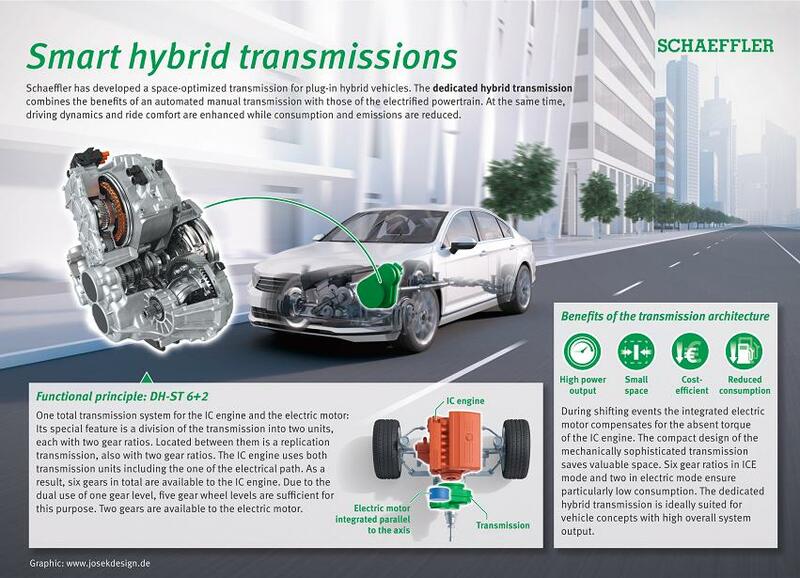 Schaeffler is already achieving great market success with double clutches and hybrid modules for hybrid vehicles today, in which the electric drive is positioned between the internal combustion engine and the transmission – a configuration that engineers refer to as a “P2 arrangement”. In the current second-generation hybrid module, one success has already been achieved: it was possible to fit the disconnect clutch that decouples the hybrid module from the internal combustion engine during electric driving inside the electric motor. In the third generation, which will be presented for the first time at the Schaeffler Symposium, the complete double clutch is fitted inside the electric motor – more precisely, inside the hollow space of the rotor. In order to ensure the necessary force-locking, multi-disk clutches of the kind fitted as standard in high-performance sports cars are used. Combined with a highly-integrated actuator for activating the three clutches, an extremely compact hybrid module is thus developed that makes the powertrain only slightly longer than in variants that are based purely on an internal combustion engine. With market shares for plug-in hybrid vehicles increasing, car makers are reviewing their transmission designs. Instead of positioning the electric motor in front of and behind the transmission, it is becoming conceivable to couple the electric drive and the transmission in such a way that they merge into one component and functional unit. Schaeffler will be presenting a revolutionary concept for one such “dedicated hybrid-shift transmission” for the first time at the Symposium. The “DH-ST 6+2” (dedicated hybrid-shift transmission) is based on an automated manual transmission and offers two electric and six mechanical gears. The electric motor that operates parallel to the internal combustion engine is integrated into the transmission structure in such a way that it has two ratios available. The advantage: the electric motor can be operated very efficiently even at high driving speeds. Two transmission stages are also exclusively available for the internal combustion engine. A type of multiplier transmission between the two sub-transmissions ensures that the internal combustion engine also uses the sub-transmission of the electrical path, which means it has four additional gears available. As one wheel plane is being used twice, only five wheel planes are required for the six gears. Simulations carried out by Schaeffler show that not only sporty driving performance is possible with the “DH-ST 6+2” and a system performance of 220 kilowatts – a very low WLTC fuel consumption of around 4.5l/100km can also be achieved. Schaeffler presented a concept vehicle with two electric axle drives on the front and rear axle back in 2011, which additionally allowed the active distribution of torque between the wheels of an axle. Since then, Schaeffler has not only put key components for such drives into volume production, but has also developed a complete modular system for electric axles. This system comprises both axially parallel and coaxial drive variants including optional components for differential, switchable dual-speed transmissions, and active torque distribution. Using a configurator that the company will be presenting for the first time at the Symposium, electric axle drives for electric and hybrid vehicles can in future be defined according to space requirements, driving performance, and functions.